Michael John Douglas (born September 5, 1951), better known by the artistic name Michael Keaton, is an American actor who became popular for his early comedic film roles, most notably his performance as the title character of Tim Burton's Beetlejuice, and later gained international fame for his dramatic portrayal of Bruce Wayne / Batman in Tim Burton's Batman and Batman Returns. He won a Golden Globe Award and was nominated for an Academy Award in 2015 for his role in Birdman. In 2016, he played Ray Kroc in The Founder. Keaton was born in Coraopolis, Pennsylvania. He lived in Robinson Township, Allegheny County, Pennsylvania. His father, George A. Douglas, worked as a civil engineer and surveyor, and his mother, Leona Elizabeth (nee Loftus), a homemaker, came from McKees Rocks, Pennsylvania. Keaton was raised in a Catholic family. He is of Irish and Scots-Irish ancestry. He attended Montour High School in Pennsylvania. Douglas studied speech for two years at Kent State, before dropping out and moving to Pittsburgh. Keaton supported Senator Bernie Sanders for President in the 2016 U.S. presidential election. 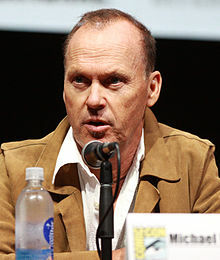 ↑ "Michael Keaton Biography". A&E Television Networks. Retrieved January 10, 2014. Actor, director. Born Michael Douglas on September 9, 1951, in Coraopolis, Pennsylvania. ↑ "Michael Keaton Biography (1950–)". Filmreference.com. Retrieved January 10, 2014. ↑ Vancheri, Barbara (November 13, 2002). "Obituary: Leona Douglas / Actor Michael Keaton's mother doted on her seven children". Pittsburgh Post-Gazette. Retrieved January 10, 2014. ↑ "Actor Michael Keaton is another who insists he is half-Scottish". Sunday Express. September 25, 2005. Retrieved January 10, 2014. ↑ Smith, Emily (February 7, 2016). "Page Six: Michael Keaton feels the Bern". New York Post. Archived from the original on February 9, 2016. Michael Keaton is the latest Hollywood star to endorse Bernie Sanders. This page was last changed on 21 August 2018, at 09:22.